Luxury Mountain Home - Mt. Rainier/Crystal Mt. Premier Getaway! MUCH more than just a ski cabin, our home was built as a primary residence. We have a large, luxurious, private home that provides the perfect blend of mountain home relaxation with all the luxury and amenities one could want. The 2500 square foot, 2002 built home boasts three downstairs bedrooms all with queen beds, sleeping six, and two full bathrooms (master bathroom has an extra-large jetted tub). The large upstairs bonus-room features a queen bed, single bed, plus lots of extra space for games, yoga, and even the TV/DVD/VCR & movies. The gourmet, fully ready kitchen will impress any cook with its Viking gas range and double ovens. The open-floor plan with dining room (beautiful table comfortably seats 10) and living room that has soaring vaulted ceilings really encourages entertaining and connection. This light filled area has wood flooring, beautiful rugs, and exposed beams throughout giving it that warm, mountain feel. Plus the downstairs den and upstairs bonus-room offer additional opportunities for fun (or privacy). The impressive fireplace houses a wood stove which really pumps out additional heat. 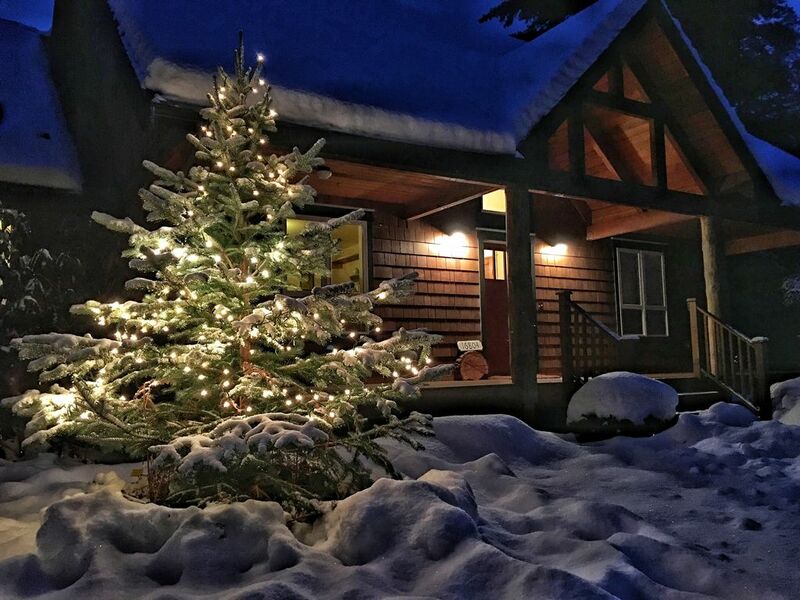 The home is only ten miles to the entrance of Crystal Mountain Ski Resort and Mt Rainier National Park (15 minutes to Mt Rainier's Sunrise entrance). A wide range of amenities are included: 40 Mbps Wi-fi, washer/dryer, stereo system,, foosball, fully-fenced backyard with fire pit, and board games. The White River is just a short walk away. There are walking/hiking opportunities within walking distance and many hiking/XC skiing/snowshoeing trails are just a short drive away. Our home is located in Crystal Village. We are skiers and enjoy sharing our home when we are not using it. We welcome guests who recycle, compost, and respect the mountain environment. Our Mountain Home was built as a primary/12-month-a-year residence and has everything you would expect. Jetted tub in the master bath with a separate shower. There is a full tub/shower in the other bathroom. Free calls within the U.S. Relax next to this great fireplace and use the integrated electric fan to heat the house for toasty comfort. Large, room with a high ceiling, lots of light, and a wonderful fireplace. Viking gas stove with a grill. Lots of pots/pans/skillets/etc. Crock pot and lots of large bowls . Also, we have a French press and an espresso maker; (to use, you need to bring coffee ground specifically for espresso). Chefs will love this gourmet kitchen complete with dual ovens, Viking range, and plenty of counter space. This large, beautiful wood table easily seats 10-people. No Cable or Satellite but bring an HDMI cord and you can stream using the Wi-Fi. Lots of classic titles to choose from. Crystal Mountain is only 21 minutes away! After four steps to enter the home, everything can be accessed from the main level. No need to climb stairs. Camp fire pit - great for roasting marshmallows! Fully fenced back yard; great for this kids! Jeff took the time to give us a tour and made sure to show us how everything worked. The set-up of this large house is ideal for a large family or multiple couples.This is the third straight year my wife, son, daughter-in-law, three grandchildren, and I have stayed in this wonderful home. The three years prior to this, we rented three different homes. None were as nice, well kept, or supported by the actual property owner. The wood-burning stove in the living room is really nice after a day on the slopes. The adults preferred to enjoy the fire and converse or read. The youngsters (ages 10 - 16) enjoyed having their own space upstairs to watch TV or play games. When the boy friend of one of the granddaughters decided to stay over one night, the two beds upstairs provided space for him to stay with our grandson. The open floor plan allowed taking turns preparing dinner in the well-equipped kitchen and still be part of everything going on downstairs. We highly recommend this home, as we certainly enjoyed and appreciated our stay. Thanks David! It's always great hosting you and your extended family. And thanks for taking care of our home too! This home is beautiful. It has a mountain cabin feel but with a gourmet kitchen and ample space. We stayed at this mountain home for a trail race during the end of July. It is a very comfortable and well appointed home. The Viking range was a pleasure to cook on. Also, we have young kids and the kitchen was stocked with kids cups, plates and silverware which was a great surprise. The location is great and is close to several trails. I would definitely recommend this home. First, what an incredibly detail-oriented owner. From the home guide binder to the labels throughout the home, you will certainly feel comfortable knowing where things are, how they work, and precisely what to expect (and what is expected of you) throughout. Second, the interior layout is spacious, gorgeous, and flows incredibly well for your group or family to completely relax. The home's design naturally does a great job at securing and maintaining warmth, and the vibe inside can be as bright and airy as you would like. Third, the location relative to Mt. Rainier and food supply could not be better. Under 30 minutes to Safeway in Enumclaw, 45 minutes to Sunrise Visitor Center, and 85 minutes to Paradise Inn. You also have fast access to nearby hiking trails and scenic lookouts. You are also walking distance down the street (directions are in home binder) to White River where you can sit and lay down in the cold and refreshing water. Be sure to rub the river's nutrient rich silt all over your face and body for amazing exfoliation - it will leave your skin looking and feeling brand new! Lastly, while we did not need to communicate with the owner except prior to arrival and after departure, Jeff was swift and - you guessed it - detail-oriented in his communication. When my friends and family return to enjoy the wonders of Mt. Rainier again, we would absolutely consider staying at Jeff's cabin home. The home was clean, spacious, and in an even more beautiful setting than the photos suggest! It was a great space for our group. The owner was super helpful, quick to reply to questions, and just really helped make our stay great! Highly recommended! Had a wonderful weekend here with my family. Cozy home about 20 mins from the slopes. Minimum $120 cleaning fee for up to 6-guests, then an additional $20 per guest.